Boston-based researchers, writing in the journal Obesity, found mice fed starchy foods developed the disease. Those fed a similar quantity of other foods did not. One obesity expert said fatty liver in today's children was "a tragedy of the future". 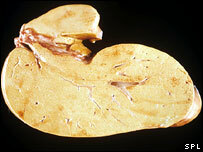 Fatty liver is exactly as it sounds - a build-up over time of fat deposits around the organ. The study, carried out at Boston Children's Hospital, looked at the effect of diets with precisely the same calorific content, but very different ingredients when measured using the glycaemic index (GI). This is a measure of how quickly the energy in the food is absorbed by the body, producing a rise in blood sugar levels - high GI foods lead to sharper rises in blood sugar, and similar rises in insulin levels, as the body releases the chemical in response. "This is a silent but dangerous epidemic," he said. "Just as type 2 diabetes exploded into our consciousness in the 1990s, so we think fatty liver will in the coming decade." Tam Fry, National Obesity Forum board member and chairman of the Child Growth Foundation, said it was clear that eating a diet rich in high-glycaemic food led to increased fat. He said: "Fatty liver is going to be one of the tragedies of the future unless we do something about it." Azmina Govindja, a dietician and spokesman for the British Dietetic Association, said that the biggest threat from a diet rich in high-glycaemic food was development of insulin resistance - the first sign of type 2 diabetes. She said: "There is a place for high-glycaemic carbohydrates in moderation as part of a balanced diet, but there's good research that eating too much can increase the risk of insulin resistance - and this can lead to serious health problems. "However, this study is interesting, as there is other evidence that people who eat a diet rich in high-glycaemic food are more likely to have more body fat."